Photography is one of the most popular forms of art. We live in a digital age where everything is centered around photos, thanks to social media platforms such as Instagram and Pinterest. Being a photographer, this is your opportunity to take advantage of this era with your own photography blog or website to put your best work out there, which is where WordPress comes in, as WordPress powers almost 27% of the internet! 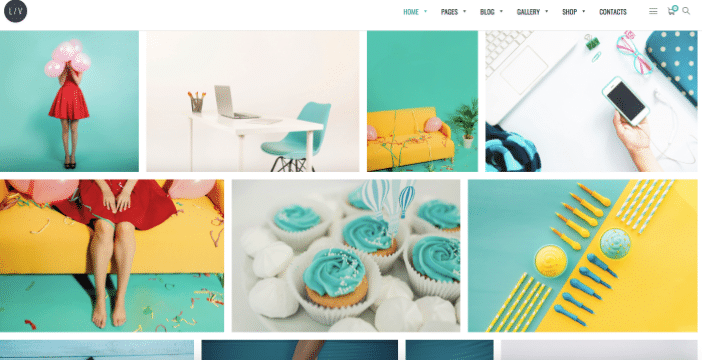 So, when it comes to setting up your photography site, you’re more than likely going to be using WordPress, and if so, you need the best Photography Theme. 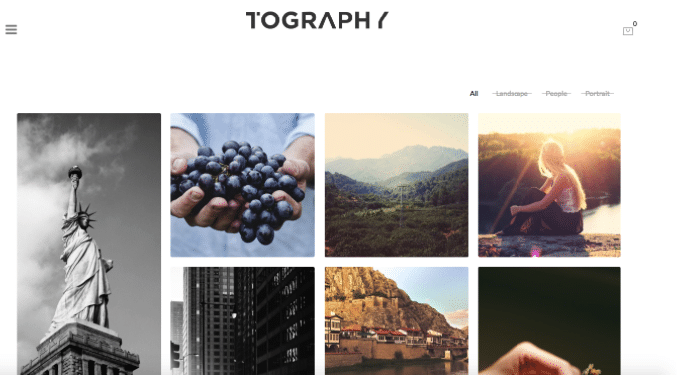 As a photographer, you want a stylish, sleek theme to show off your talents. The style is a major factor when choosing a photography theme because it’s going to be the first thing your clients see when they visit your site. 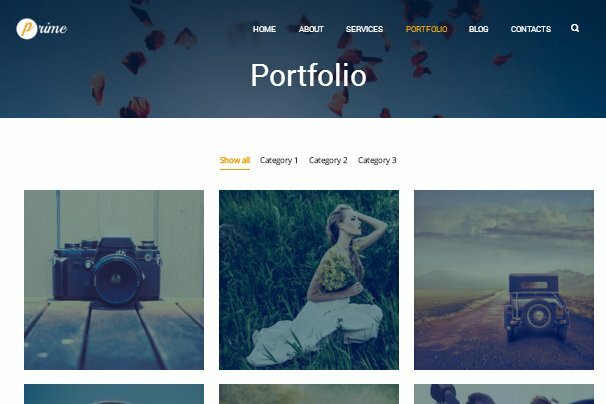 A simple theme that has clean lines and a gallery or section for you to showcase your portfolio is ideal. Here is a list of 50+ best photography themes for you to choose from to represent yourself as the professional photographer that you are! 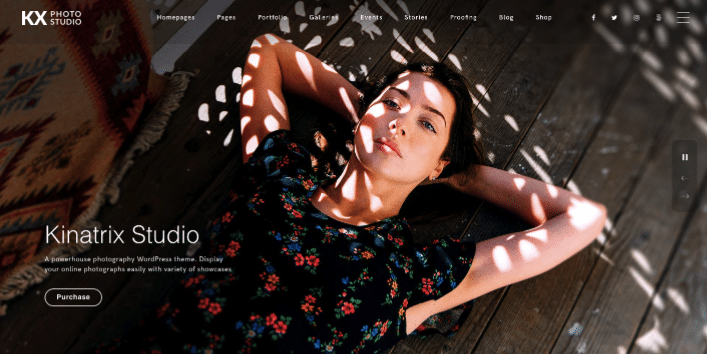 Skylab is a dedicated photography theme designed for portfolios. It comes in 12 different demos and features the Visual Composer page builder plugin to make building custom pages as simple as can be. 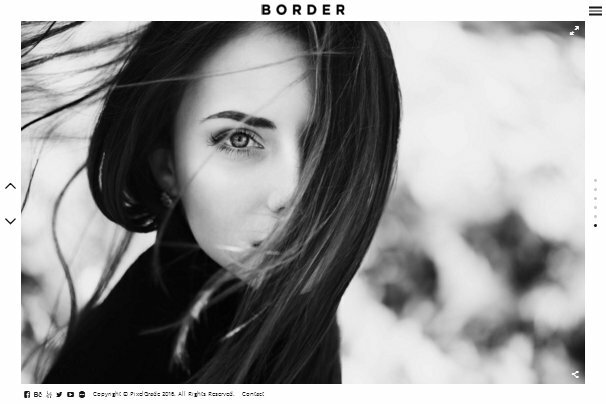 BORDER is a portfolio photography theme designed to showcase your best work. Its galleries use smooth animations and stunning typography. You can even build several different portfolio projects. 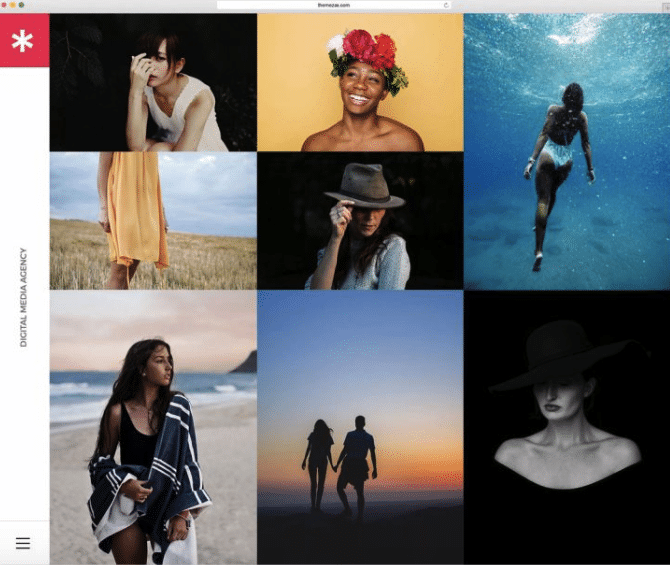 Photography is a creative photography theme that comes in over 20 different demos and includes over 70 different predefined templates for galleries. It uses a content builder with a keynote-like interface. 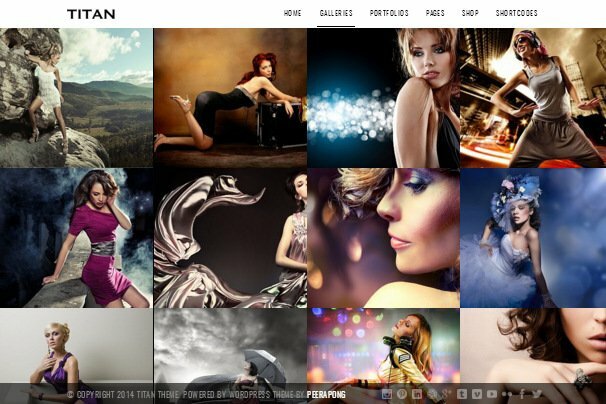 Titan is a portfolio photography theme that comes with 14 gallery templates and seven portfolio templates. It also has eight homepage gallery options. The portfolio includes an advanced filtering feature you can enable on your site. Vega is a creative portfolio theme for photographers. It includes an easy-to-use content builder that lets you decide how and where you would like your galleries displayed. The homepage can have a parallax header background, and fullscreen templates are also available. 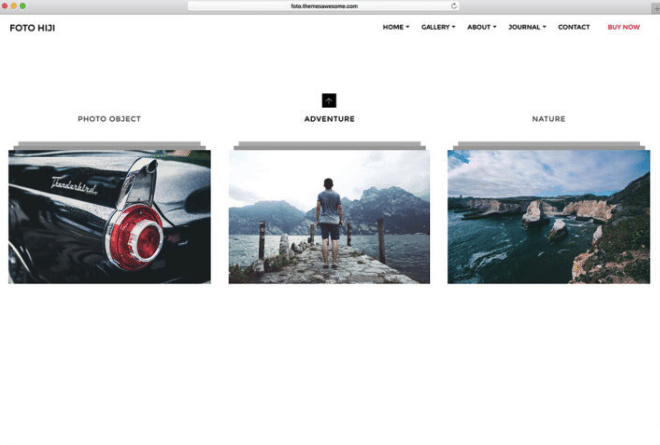 Heat is a portfolio photography theme that uses a masonry-style grid to display photos on the homepage. It also includes business features, making it a great option for professional photographers. 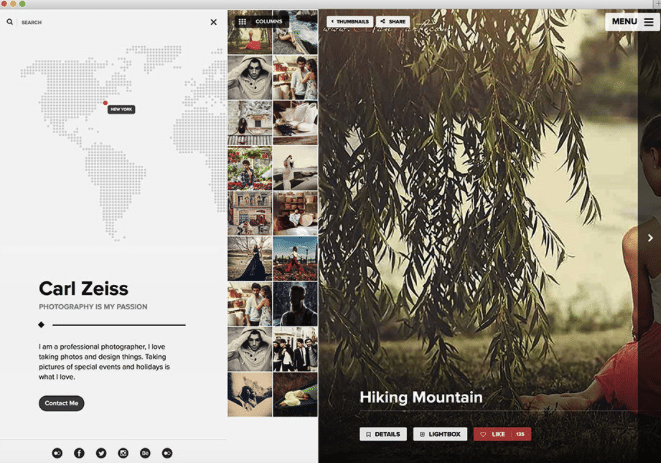 Kinetika is a photography theme built for professionals. It comes with several different header and demo options. Professional features include event listings and a Contact Us widget. It’s also easy to customize using a page builder. 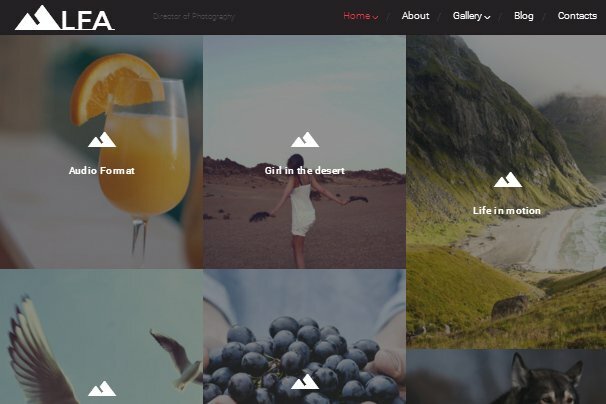 Armada is a creative portfolio photography theme designed to portray your work with style. In fact, it comes with 16 ready-made skins. You’ll enjoy multiple layout options for portfolios and easy-to-customize styles. Quantum is a minimalist portfolio photography theme that comes in light and dark skins and several different homepage options. You can pick from several different project page options and different styles for galleries. Kameron is a photography theme that comes with three ready-made demos. It’s a creative theme for professionals that features pages for pricing and services. It uses a horizontal portfolio layout and fullscreen galleries with support for social share buttons. 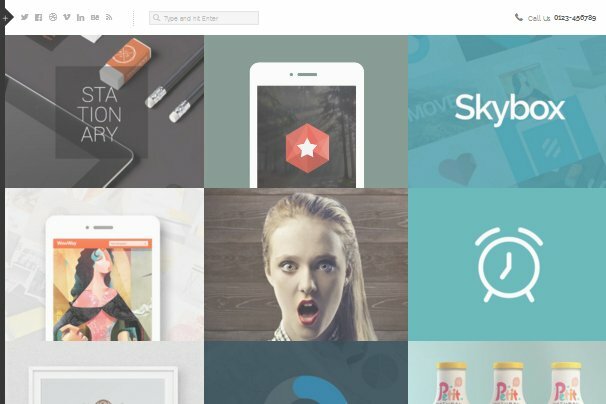 Oshine is a multi-purpose creative portfolio theme. It features several different demos that make it suitable as a photography theme, including such demos as V2, V17, V22 and V24. V17 is featured below. Hazel is a multi-purpose creative theme that comes with dozens of demos, including five portfolio demos. The Kira demo is featured below. It also features several different layouts for several different elements to help you make this theme your own. The Ken is a multi-purpose creative theme designed for creative professionals. Its Photographer demo, pictured below, is perfect for professional photographers. The homepage lets you list your skills, latest projects, portfolio and more. 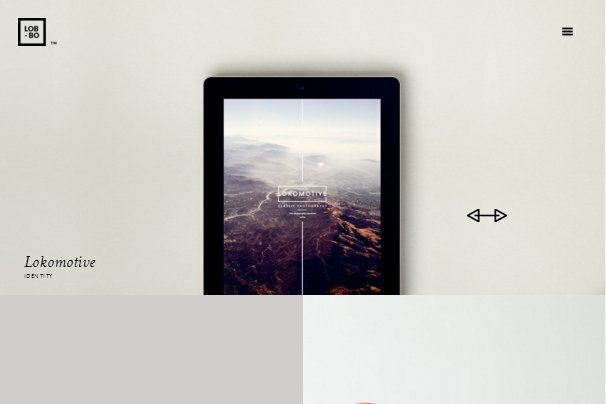 WowWay is an interactive portfolio theme for photographers. It uses a responsive grid on the homepage and makes great use of the live theme customizer. It also lets you choose custom options for different projects. 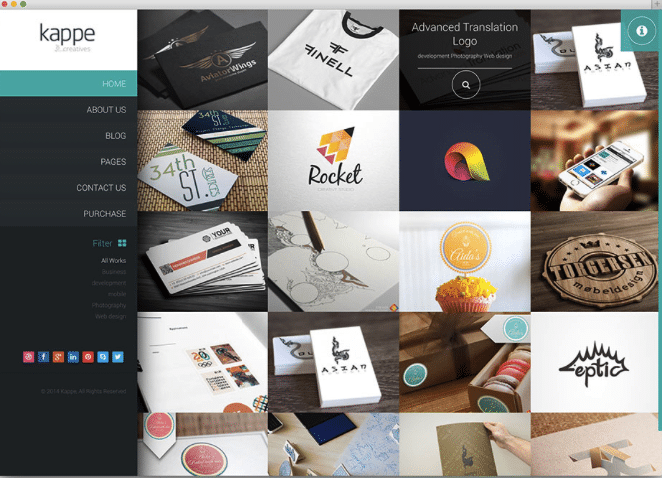 Lobo is a portfolio theme for creative professionals. It comes with a content module builder that lets you design your own layouts. It also comes with isotope and masonry layouts. Art Gallery is a business theme designed for photographers. It lets you showcase your work while leading potential customers down the homepage to a contact form and Google Map. LFA is very similar to Art Gallery in terms of functionality. It’s a photography theme that comes with numerous business features and displays photography in a stylish way. 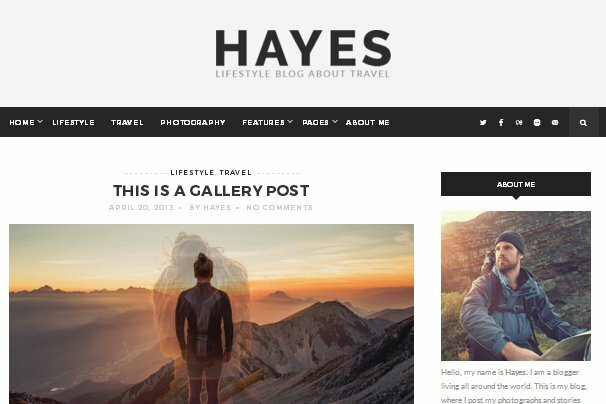 Hayes is a photography theme for bloggers. It makes great use of imagery, making it a great option for a photographer who likes to share stories with their images. It’s also very easy to customize. Photographer Portfolio is another theme designed for professional photographers, only this one supports teams and creative agencies. Its homepage has support for a gallery, an overview of your portfolio, testimonials from past clients and more. 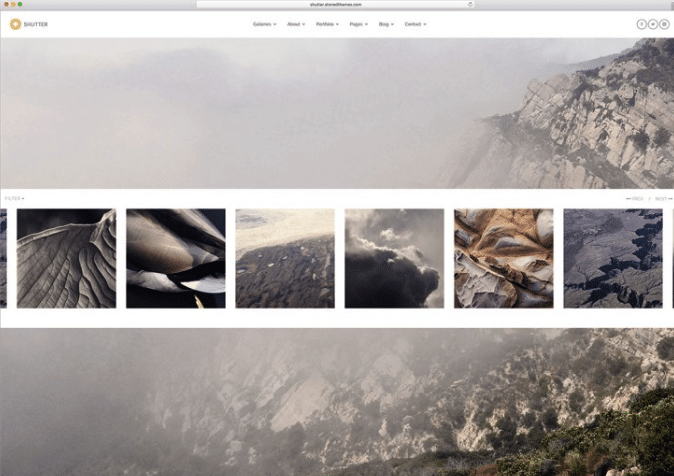 Photex is a photography theme designed for portfolios. Its homepage features a masonry grid, and you can use a toggle effect to turn on an overlay that turns your images into black and white. It also comes with an animated contact form. Coastline is a portfolio photography theme whose homepage is comprised of an entire grid layout of portfolio items. Portfolios come in flexible layout options so you can enjoy variety in the way you showcase your work. 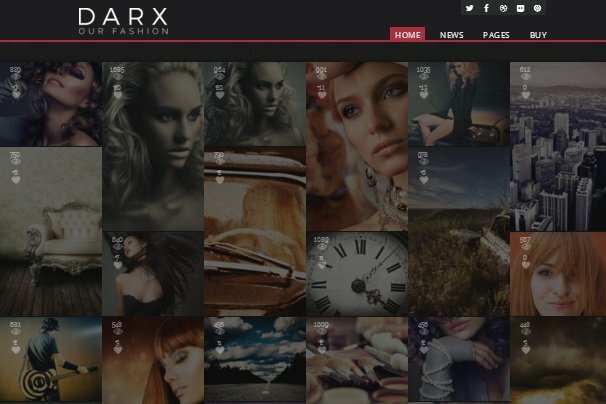 Darx is a portfolio photography theme that uses a dark skin and a masonry grid layout on the homepage. Portfolio pages come with a number of different options so you can customize your site the way you want it. Memories is a simple portfolio photography theme that showcases your work against a dark skin. It was developed by the same team that developed Darx, so it also features multiple layout options for portfolios. Glare is a stylish portfolio theme. It features a fullscreen image background and flexible galleries. It also makes great use of the live theme customizer to make small changes as simple as can be to implement. 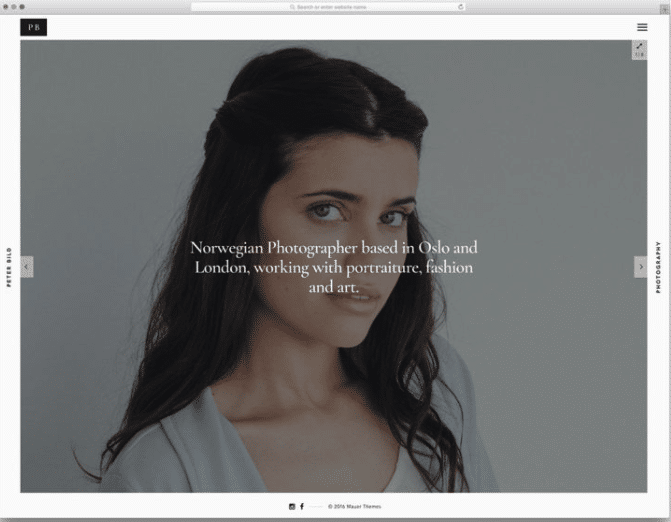 True North is a minimalist portfolio photography theme that uses beautiful imagery to complete its look. This makes it a great option for photographers. 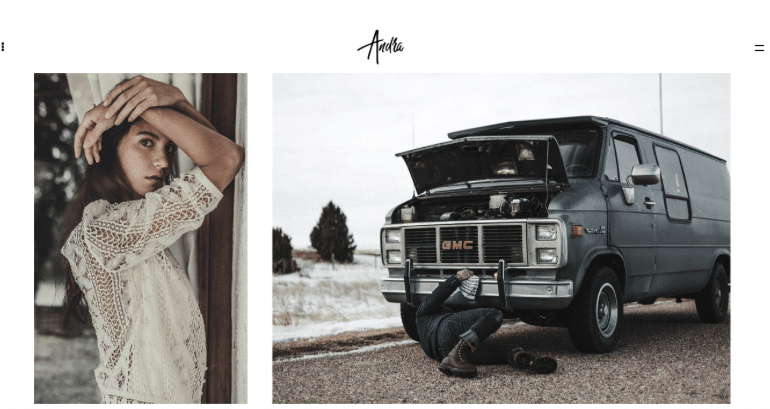 Amiable is a minimalist portfolio theme for photographers. It features a number of different layout options to make picking and building a customizable style as simple as can be. Exposure is a gorgeous responsive WordPress theme that has everything that a professional photographer would need. This theme is highly attractive but still lets the photography do the talking. The theme’s elegant design is incorporated in all of its pages, with the important gallery page well considered. Exposure offers a huge array of theme customization options, shortcodes, and even an events calendar. 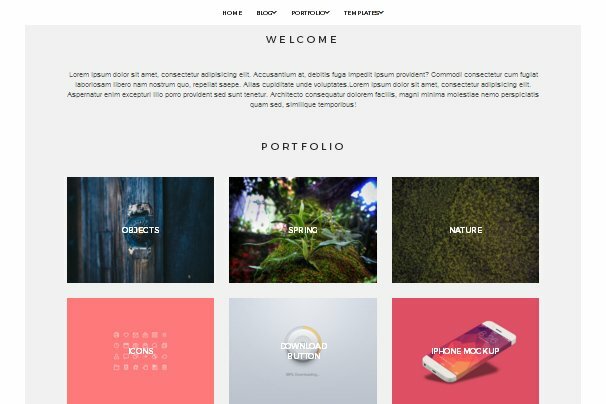 If you want a theme that is going to catch eyes, showcase your work, and is easy to use, this is it. Pinhole is named after a popular camera, and much like that camera, it’s a highly useful theme without any unnecessary extras. 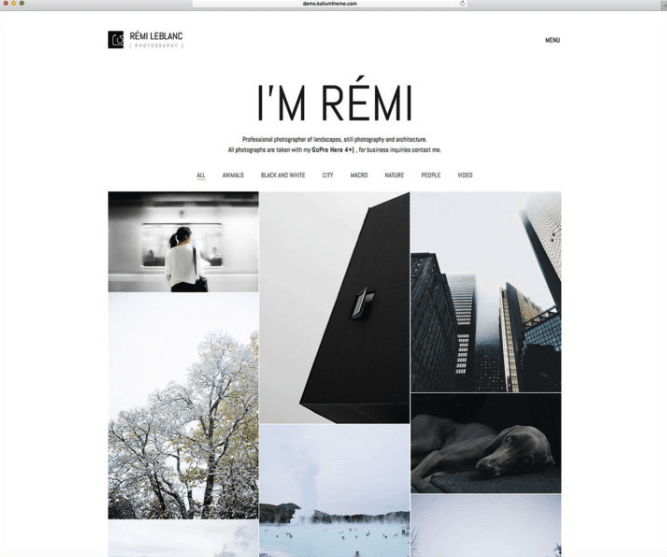 This theme is a minimalist, clean and simple theme to showcase your photography. There are five different homepage designs that mix and match elements from five header styles and 30 different layouts. There are several handy features to this theme such as a restricted client login area, image download, and photo proofing. Pinhole is a refreshing option that will enable you to display your best work without any fuss. Kalium is a super attractive, modern, fully responsive WordPress theme. 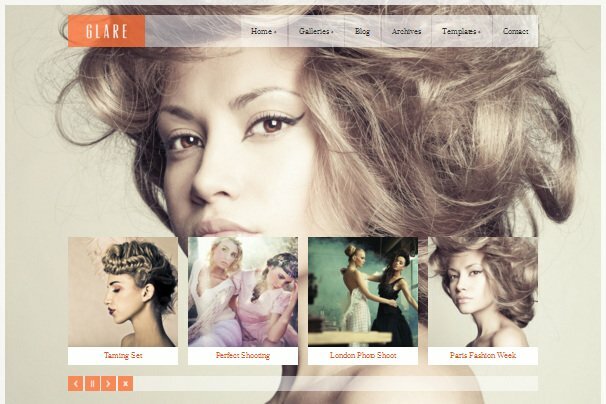 This theme is multipurpose and has a section for a portfolio and even an online shop. Kalium has several different layout designs, drag and drop elements, and tons of customization options so that you can create a stunning, unique site in a matter of minutes. Kalium is multilingual and can be translated into 16 different languages. This theme is perfect for photographers, photojournalists, or anyone in possession of high-quality images that need to be seen by the world. 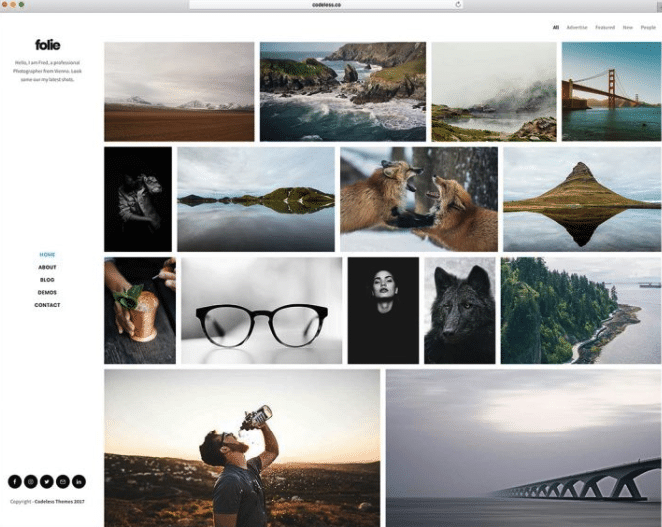 Foto is an easy to use, helpful, fully responsive WordPress theme that will meet the needs of any photographer. This theme is sophisticated, modern, and fully customizable, and is perfect for bringing your images to life. Foto offers 15 different album options and 33 gallery options, so you can fine-tune it to meet your expectations. This theme is super easy to implement and even simpler for your audience to navigate. There are not many themes out there that can showcase your work like Foto. 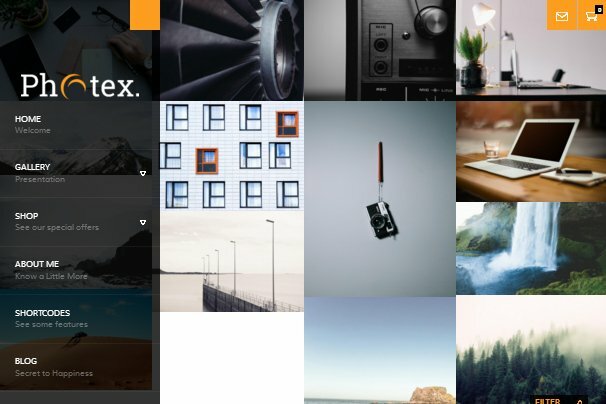 Darkroom is a trendy WordPress theme that’s extremely easy to install and fully customizable to let photographers put their own unique stamp on their site. This theme is completely responsive and adjusts perfectly to any device, such as your computer, tablet, or smartphone. You can choose your own color scheme, choose between several different awesome sliders, and it also has a section for your portfolio. 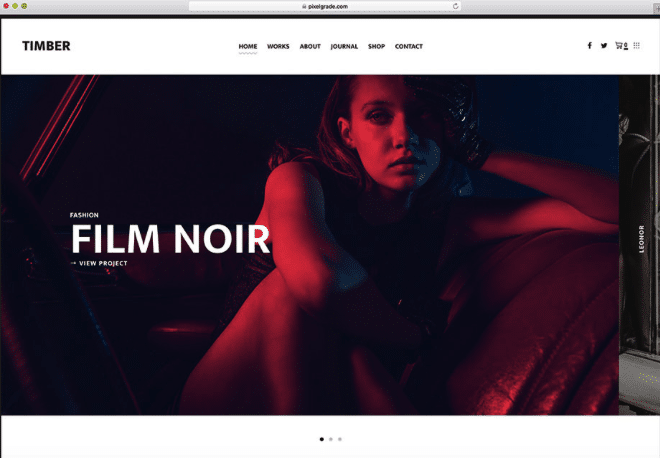 Darkroom is a theme that includes full-screen slideshows and is compatible with the WooCommerce plugin, which allows you to set up your own online store. Aside from the amazing design and ease of application, this theme makes navigation easy for your visitors. Scent is a fully responsive and retina ready WordPress theme perfect for professionals wanting to show off their portfolios with both video and images. If you’re a photographer looking for models, it even includes a model submission form. Other features of this Hollywoodish theme includes video and full-screen sliders, translation ready coding, and the option to display your content in both one page and multi-page configurations. 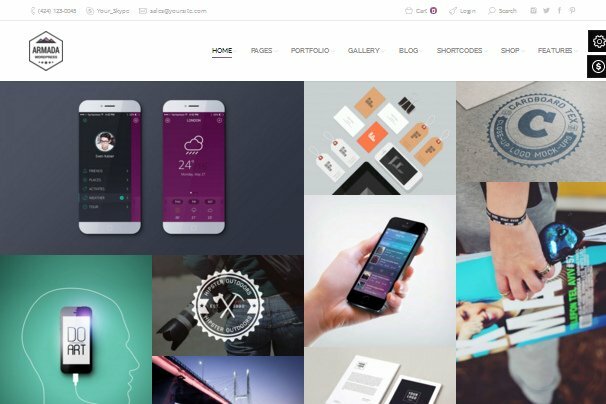 This beautifully designed theme will show off your work like no other. Uncode is a gorgeous, tech-savvy, engaging, and easy to navigate WordPress theme that is readily responsive. This is a perfect theme for those photographers with no prior experience in coding. Uncode has endless options when it comes to customization, as it’s one of the most flexible themes on the market. Customize your portfolio and blog layout however you see fit with over 16 different layouts to choose from. 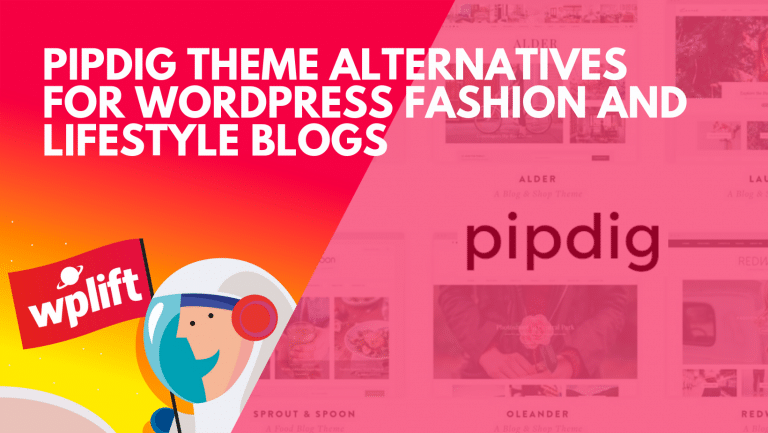 This theme comes WooCommerce ready and has sleek plugins allowing you to showcase your creative work to the world with ease. Fluxus is a beautifully designed, fully responsive WordPress theme that features a horizontal portfolio layout. This unique design allows you to showcase your work side by side. Fluxus is lightweight, focused, and has several theme options. This theme allows social media sharing and supports video in blog posts and portfolio projects. Fluxus is the perfect theme for photographers because the focus is on large high-resolution images, minimal design, and gorgeous typography to really highlight your work. Lavr is a unique, bold contemporary style WordPress theme perfect for photographers looking for a creative way to display their portfolio. With this theme, you can build a stunning site using 16 different homepages, an unlimited number of portfolio pages, and plenty of customization options. Lavr comes fully responsive and retina ready. This theme is very easy on the eyes, but also comes with easy color management, so making changes is super simple. With its beautiful design and easy navigation, Lavr is a must see. Kinatrix is an impressive WordPress theme with both a light and dark option. This 100% responsive and retina ready theme comes with full-screen galleries, a portfolio gallery, client management, and photo proofing. Kinatrix is ideal for the professional photographer wanting to create a unique site that’s easy for visitors to navigate and even leave testimonials. Manage events using the inbuilt functions and set up shop using the WooCommerce plugin. Kinatrix has got all your needs covered. 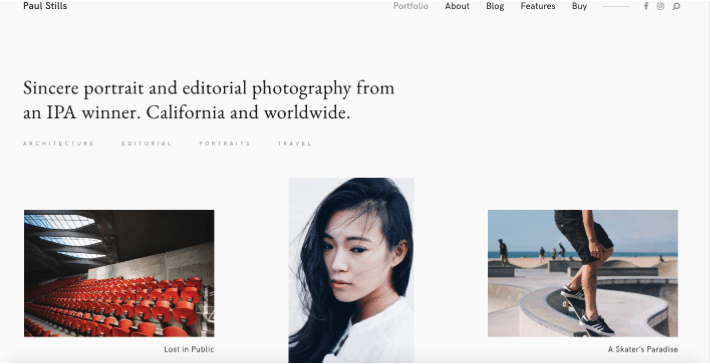 Andra is a minimal, sleek WordPress theme perfect for photographers, artists, designers, or anyone looking to showcase their creative work. This fully responsive theme is retina ready and has advanced theme options making it completely customizable. Other features include advanced typography with over 600 different web fonts, unlimited color options, and WPML compatibility if you prefer multilingual capabilities on your site. Andra has everything you need to build the most stunning photography site possible. 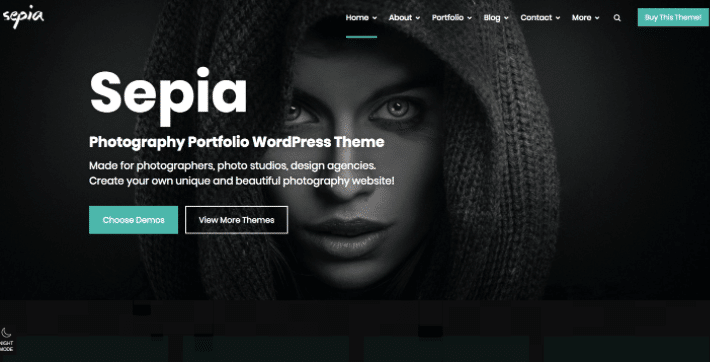 Kreativa is beautiful and modern WordPress theme with huge photos perfect for the professional photographer. Features include gallery thumbnail hover effects, theme options such as skin, font and color pickers, and client management and proofing. This theme is 100% responsive, so no matter what type of device you’re visiting from, it will adjust to your screen size and resolution. Kreativa also offers fullscreen and portfolio galleries as well as background slideshows and videos. This theme will make even the most amateur photographer look as if they’ve been in the business forever. 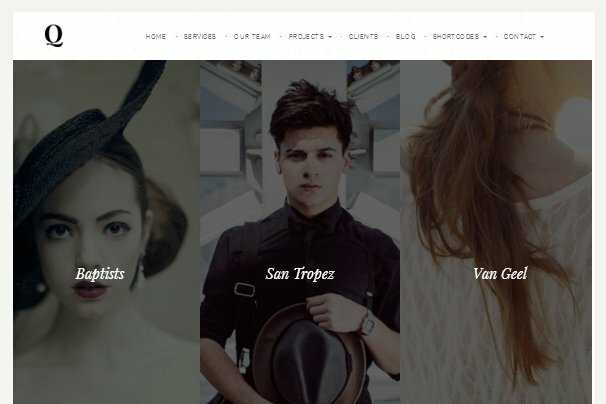 Sepia is a clean and neat designed WordPress theme ideal for photographers. This theme is fully responsive and looks amazing on any device, such as a laptop, smartphone, or tablet. Sepia features a light and dark version, 18 different album page styles, 16 different gallery styles, and easy customization options. You can easily create your own unique and professional photography website within minutes with Sepia. Stills is a one of a kind, simple designed WordPress theme that is spacious and uncluttered. What makes this theme so different is the fact that your photos are published uncropped so that your vision gets delivered. Features of this theme include galleries with hashtags, custom fonts, and flexible custom colors. Stills is completely responsive and looks great on retina. The well organized, clean theme creates a unique user experience and really allows your images to shine. This theme is a must see! 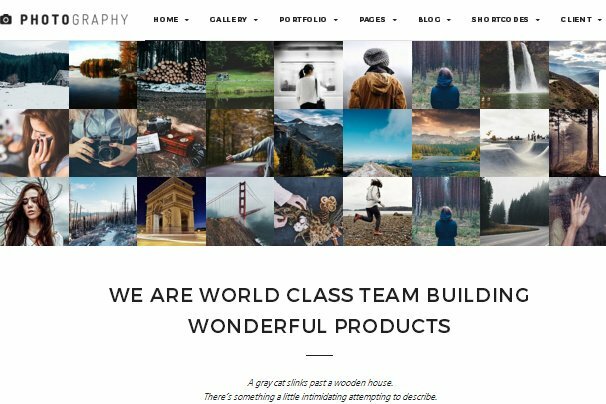 Tography is a professional, elegant WordPress theme that’s the only theme designed for photographers by photographers. This theme comes fully responsive and retina ready. The WooCommerce extension is integrated so you can upload and sell your photography seamlessly. 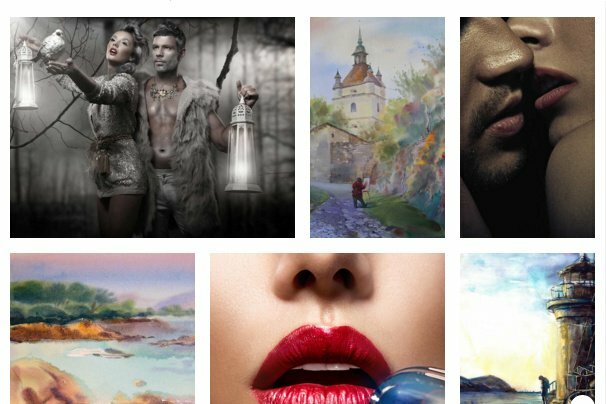 There’s a private gallery for your clients, unlimited color options, and unlimited portfolio and galleries, among many other features. Tography is simple to install, easy for visitors to navigate, and is just the perfect theme for both seasoned photographers and those just starting out! 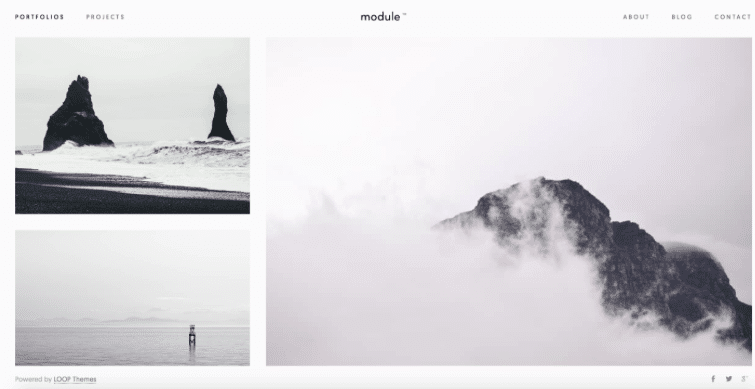 Module is a minimal, classy photography WordPress theme that is a must see. It’s simple, clean design really makes your photography stand out. With Module, you’re able to customize anything from your text to your fonts and colors. This theme doesn’t require any coding of any kind, as all the hard work is already done for you. The design is beautiful and with Module, your site would not only be very appealing to users but also easy to navigate. Frame Photography is a bold and attractive, fully responsive WordPress theme that has a light and dark skin to choose from. Features include a fullscreen grid gallery and portfolio, video and image homepages, over 600 Google fonts to choose from, and easy color management. With all of the customizations available, you can have your own unique photography site up and running in no time. With the images displayed so big, Frame Photography is perfect for photographers. You are sure to catch your visitors’ attention with this theme. Click is a stunning WordPress theme that is fully responsive and perfect for photographers, photo bloggers, or modeling agencies. Features of this translation ready, elegant theme include custom slider options, a separate blog page, sidebar options, related post options, background image, and custom colors. Click is super attractive and with this theme, your creativity shines through to everyone who visits your site. 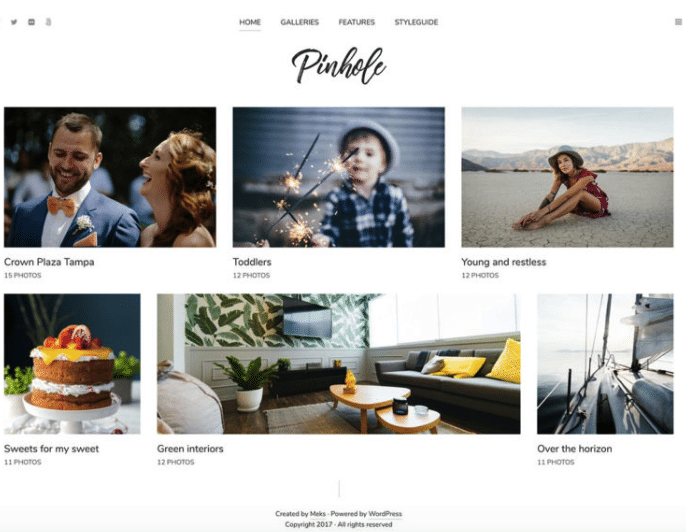 Folie is an elegant and stunning, 100% responsive WordPress theme that will allow you to have the most stylish photography website online. Folie is fully customizable, so you can play around with all of the options to create the best site for your business. Features include over 20 slider templates, parallax images, unlimited header layouts, and over 600 Google fonts available. Its eloquent portfolios and galleries showcase visual works in an appealing and captivating light. Folie’s design is beautiful and its easy navigation will keep your visitors coming back for more. 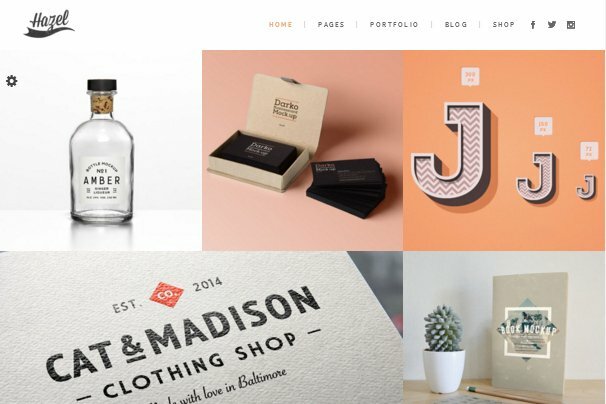 Timber is a unique and impressive, super creative WordPress theme that has been designed with photographers and other creatives in mind. This theme allows you to show off your high-quality images in a visually stunning way that will make a lasting impact on your visitors. Timber is completely responsive and ready to work on all devices from laptops to smartphones. Features of this innovative theme include an amazing portfolio, smart galleries, video support, and frontpage flexibility. This theme comes with everything you need to position yourself as the professional photographer you are, all that’s left is for you to add your creative content and take off. Moon is beautiful, lightweight WordPress theme that aims to improve your website by offering numerous useful website tools. This theme is completely responsive and retina ready, as this theme adapts to whatever screen size your visitor is using. Features of Moon include 24 different homepage layouts, photo color match, customer testimonials, a contact form, and more. 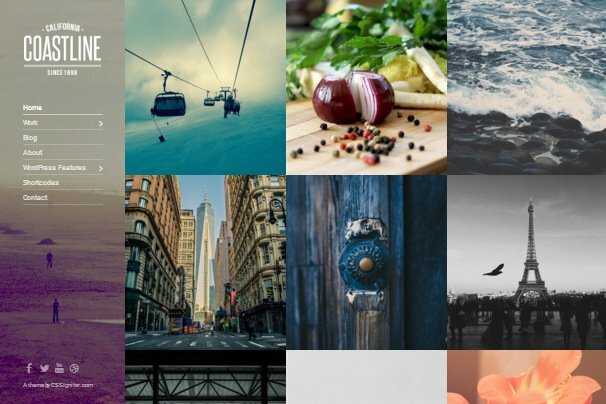 With appealing social sharing buttons, visitors can share your work with the world. Moon offers endless ways to be creative and showcase your uniqueness, your only job is choosing this theme and uploading your content. 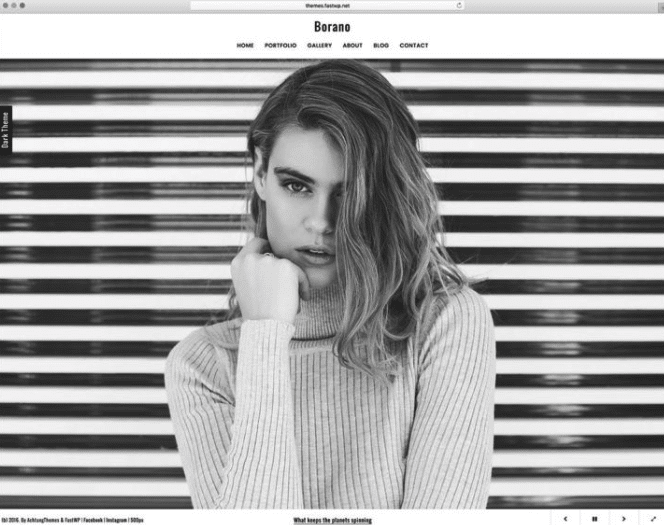 Borano is a sleek and attractive, fast loading, responsive WordPress theme for professional photographers. This retina ready theme is fully functional and appeals to your visitors with its pristine layouts and audiovisual content. Features of Borano include a light and dark skin to choose from, gallery and portfolio homepage, five project pages, a personal page, and multiple slideshows. This theme is ready to go from day one, delivering you a fully customizable, stunning, simple theme that is super easy to set up and navigate. It’s a must see! 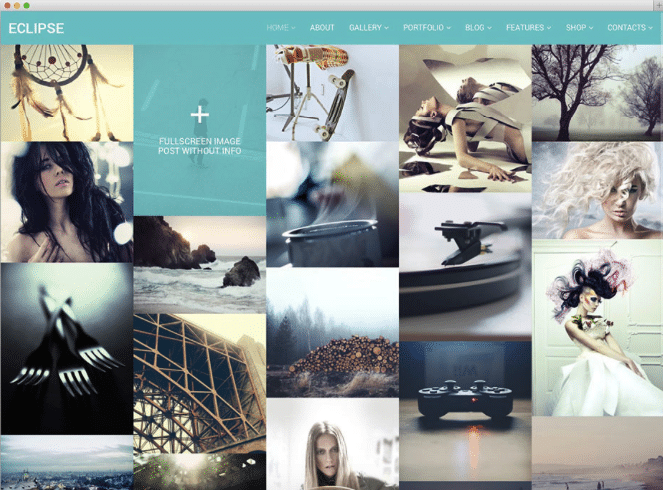 Pofo is an eloquent, modern, creative WordPress theme for a photography portfolio website. This theme is retina ready, fully responsive, and requires no coding experience at all. Pofo is highly customizable with over 150 prebuilt elements and 200 templates to appeal to your creative taste. With all of the design choices to choose from, you can mix and match elements and animations to your heart’s content. Features include custom sidebars and widgets, font icons, gorgeous header styles, numerous page layouts, portfolio, WooCommerce integration, and much more. Get everything you need and more with Pofo. Bild is a smooth, polished, stunning WordPress theme focused on photography. 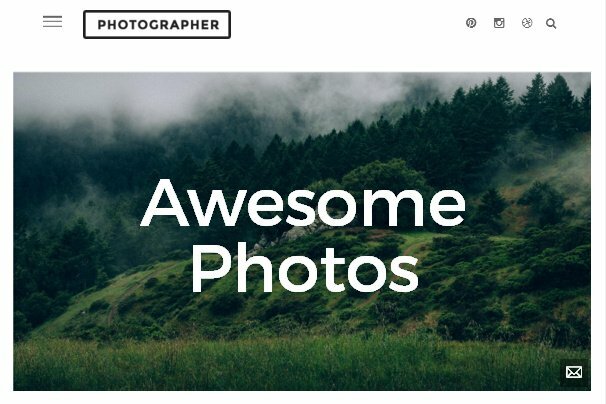 This highly responsive theme is retina ready and is uber unique for a unique photographer. Bild is equipped with some of the most advanced tools for handling the most high-quality image and video content. Its minimalist, clean design puts all of the attention on your photos, as it should be. You’re able to tune your site with over 6 different colors and 800 Google fonts. Bild features fullscreen swipeable picture galleries, galleries and portfolios, and is translation-ready. This theme is fast loading and easy on servers, so your visitors won’t have any trouble browsing your site and they’ll keep coming back. Shutter is an impressive, gorgeous, minimal WordPress theme with cutting edge technology that’s highly responsive. Perfect for photographers and artists, this theme is the ideal solution for those creatives looking for a unique, elegant way to showcase their visual work. Shutter does an amazing job of displaying your work in a classy manner while keeping your website clean and put together. Features include eight gallery templates with categories, two preset skins, a full-screen slider with cool effects, and it comes WooCommerce ready, so you can set up shop with just a few clicks of a button. Because of its uncomplicated design and easy navigation, Shutter is one of the best themes for photographers. eClipse is a simple, clean and minimalist photography WordPress theme that will make your work stand out. This fully responsive, retina ready theme is versatile and comes with several different homepage layouts, image, video, pattern and color backgrounds that makes customization fast and easy. Other features include fullscreen Masonry portfolio, fullscreen video patterns, a light and dark skin to choose from, and custom page templates. 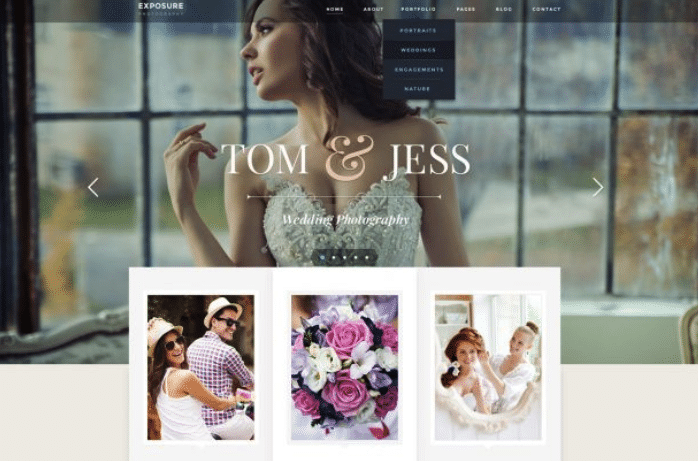 This beautifully designed theme was designed with the photographer in mind. It’s truly a must see! Kappe is a modern, classy, gorgeous WordPress theme perfect for showcasing a photography portfolio. This 100% responsive theme is optimized for mobile devices such as smartphones and tablets. Features of this stunning theme include a Masonry blog layout, unlimited color choices, unlimited sidebars, five custom widgets, and over 500 Google fonts. The bold portfolio layout really grabs your visitors’ attention. What photographer wouldn’t want to go with this theme? TwoFold is a gorgeous, powerful, engaging WordPress fullscreen photography theme that is fully responsive and retina ready. TwoFold has been equipped with the most unique set of features, resources, and elements that will make your creative work shine. Features include over 11 homepage layouts, six different album and gallery layouts, five collection pages with filters, and three blog layouts. Everything from fonts and colors are customizable, allowing your creativity to shine through. 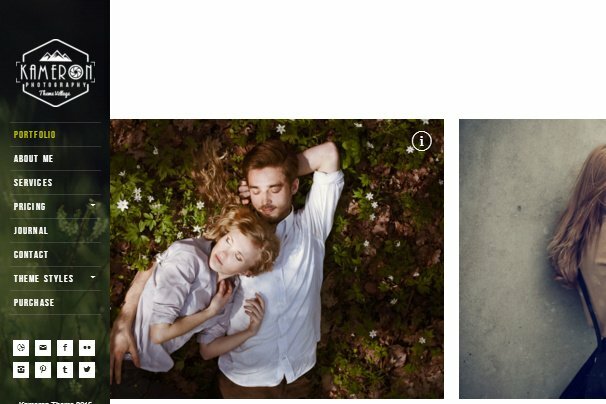 TwoFold also has three different unique photo hover effects that will give a memorable experience to your visitors. If you’re looking for something that will align with your personality, while still being easy to use and functional, TwoFold is it! Photographers are creatives and you deserve a professional online presence that is unique and creative enough to let visitors know what to expect when working with you. Picking one of these 43 themes will do just that. Once you choose, you can play with them for hours, customizing everything to your heart’s desire. Every one of these themes are compatible with page builders such as Divi and Elementor. Both are extremely intuitive and work by dragging and dropping which makes the whole theme building process a breeze. Once you have your theme all put together, you’re going to attract many clients just from the creativity and professionalism that your new WordPress site showcases, alone. Being a professional photographer and graphic designer, my portfolio website has been the biggest asset for my business. A little work on its optimization and you start getting organic clients as well.